Stories are important. As writers we all know this. We all want to make a mark on the world with our writing and to make a difference. We want to write stories that matter. 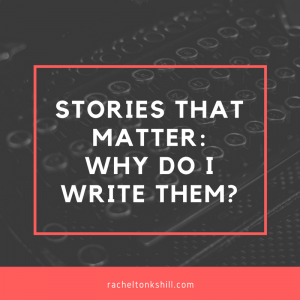 I spoke a little about wanting to write stories that matter in my introductory post, but didn’t get to explore the subject in any great detail. This post revisits the subject in more depth. What do I mean by “stories that matter”? It’s all too easy to write something like “I want to write stories that matter,” but what does that really mean? I mean something specific when I talk about stories that matter in relation to my own work. The stories I want to write are the ones that would have made the biggest difference to me when I was a kid. Meaning, those stories that would have made me feel less alone. I want to read stories that make me feel less alone, less like a freak, and I know other people do too. Especially those who often find themselves left out of mainstream stories. You know, people who aren’t straight white cisgendered men. The stories that matter most to me are the ones that can help other people who fall outside those demographics. As a writer I want to touch the people who read my work. I guess all writers do; we’re manipulative fucks who just want to make people feel. But I don’t just want to yank on their emotions for the sake of it. I want to make a real impact. That’s why I write. That’s why I focus on stories that matter, stories that can make a real difference. I know first hand the joy of seeing a character in a story just like you. I know how much of a difference it can make. The stories that really matter are the ones that give us hope. When things are hard and everything seems dark, they give us light. They tell us we can be whatever we want. That’s why I write. To tell people they matter too, that they can do the thing they want to do. And if I can make just one person feel less alone, then everything I have ever written will have been worth the effort. I want to make my mark on the world with my writing. I want to make a difference, to change things for the better. Even if it’s only my small corner. And I will use my words to do that, by writing stories that matter. So I’m gonna fill my stories with people who look like me, a fat, queer, neuroatypical woman. I will write about people of colour, people with disabilities, trans, nonbinary and gender non-conforming people, and people in non-monogamous relationships, because then I can be sure that my stories matter. And if you have a problem with that? That’s okay. You’ll find plenty of people who look like you in other people’s stories.